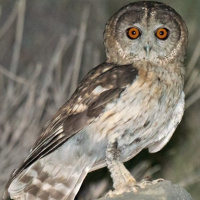 The Omani owl is a medium-sized owl with a rounded head, no ear-tufts, long legs and a short tail. It was discovered in 2013. Typical call - Al Hajar Mountains, Oman. May 2013. © Arnoud van den Berg. Description: The facial disc is grey, with the darkest grey above the eyes forming distinct dusky "brows", and paler grey between the eyes, around bill and on the chin. The distinct rim is blackish on the inside and whitish on the outside, with a dark streak broadly edged in white coming down on forehead almost until between the eyes. Pupils are black, with each iris orange-yellow surrounded by black. Eyelids are black. Bill is pale green-grey. The crown, nape, collar and throat is buff-brown with small blackish spade-shaped bars on the back of the head and blackish streaks on the throat. Mantle, scapulars, back, rump and uppertail-coverts are dark grey-brown with buff and whitish spots. The breast is buffish white with short longitudinal stripes. The whitish belly is not demarcated from the breast but is paler with longer thin blackish vertical stripes. The flank is as pale as the belly with a few slightly thicker and longer longitudinal blackish stripes. The abdomen, undertail-coverts and thigh are greyish white. The wing remiges are greyish brown with pale bars. On the upperside, remiges are mostly dark brown, with broad dark brown bars and narrow pale brown bars and top. Alula is dark brown-grey. The greater coverts are brown, the three outer ones have a large white spot near top. Median coverts are brown, two outer ones also have a white spot near top. Lesser and marginal coverts are brown. Greater, median and lesser primary coverts are dark blackish-brown. On the underside, remiges are whitish at the base and greyish at the top. From inside to outside of the wing there are dark bars becoming wider, rendering outer primaries largely dark. The inner primaries are white at the base with dark bars becoming broader towards the top, while the secondaries are white with narrow dark bars and a broad dark top. Greater, median, lesser and marginal underwing-coverts are greyish white. Greater under primary coverts are blackish brown, median under primary coverts white, and lesser under primary coverts greyish white. Tail rectrices are whitish with a white base on the underside and with two broad blackish bars caudally, equal in width to the white in between and on top, and there are two vague narrow dark bars distally. Tibia, tarsus and toes are feathered whitish. Claws are pale greyish. Size: No size data available. Habits: Unknown. Probably a generally nocturnal bird. Voice: Calls are apparently quite variable, with several described. A loud 4-note hoot, the first note is lower, the second rises slightly in pitch and the final two stay at or close to this higher pitch - HU... HWA... ha-hA. A common variant has an additional, short and slightly lower-pitched note or occasionally two, after the last accented one, - HU... HWA... ha-HA-ha(ha). A pulsing sequence of hoots with a subtle rise and fall in frequency and intensity - hu-hu-hu-hu-hu-hu-hu-hu-hu-hu-hu-hu-hu. The alarm call is a rapid series of fairly nasal-sounding barks, each with predominantly rising intonation. The contact call is usually a nasal, rising sound - NYEP. Hunting & Food: Unknown. Likely similar to other Strix owls. 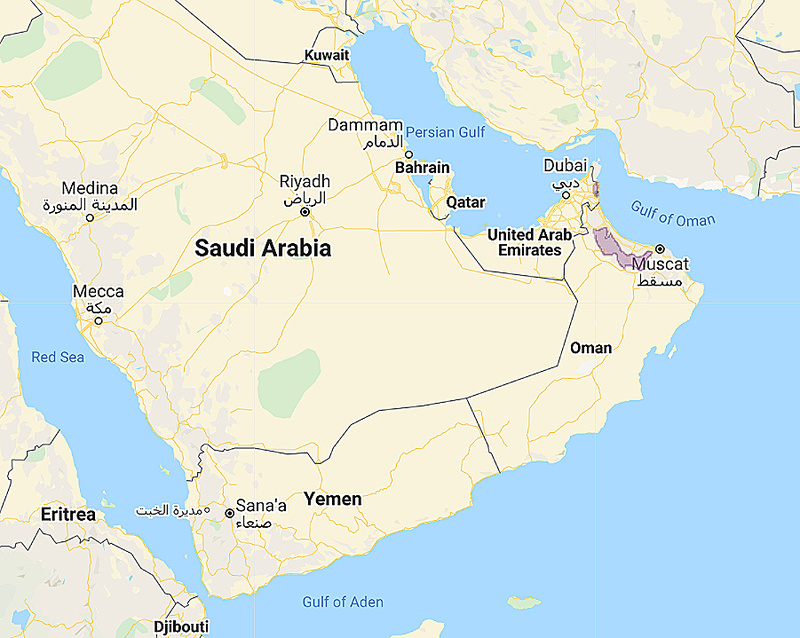 Distribution: Al Hajar Mountains in northeastern Oman. Original Description: Robb, Magnus; Arnoud B van den Berg & Mark Constantine, 2013. Dutch Birding 35 (5): 275-310. Robb, Magnus; Arnoud B van den Berg & Mark Constantine. 2013. 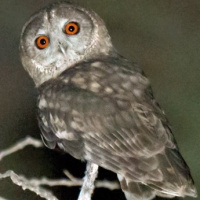 "A new species of Strix owl from Oman". Dutch Birding 35 (5): 275-310. See also: Other owls from The Middle East, Genus: Strix.